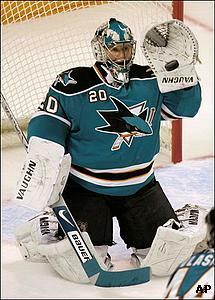 One of the few concerns for the San Jose Sharks this season has been the heavy workload on goaltender Evgeni Nabokov. That doesn't seem like much of an issue anymore for the league's hottest team. Nabokov will likely start following a rare night off when the Sharks host the Minnesota Wild on Wednesday in a matchup of division leaders. Nabokov leads the NHL this season with 69 starts after making only 49 in all of 2006-07 while splitting time with Vesa Toskala. The lack of a proven backup forced Nabokov to become a workhorse, but Brian Boucher may have emerged just in time for the Pacific Division-leading Sharks (43-21-9). After recording a shutout in his season debut on March 1, Boucher stopped 29 shots as the Sharks won their ninth straight on the road, 2-1 over Los Angeles on Tuesday. Sharks coach Ron Wilson likely would have started Nabokov on back-to-back nights earlier this season, but having Boucher allowed him to rest his No. 1 netminder for this matchup against Northwest-leading Minnesota (39-26-8). "These back-to-back games, with the travel that we've had, it's huge to have the confidence that we have in Boosh," said Wilson, whose team was outshot 10-1 in the third period. "He did a great job, especially at the end." Boucher, a 10-year veteran, spent most of this season with the AHL's Philadelphia Phantoms before signing with San Jose as a free agent on Feb. 26. Joe Thornton and Patrick Rissmiller scored for the Sharks, who rebounded after their franchise-record 11-game winning streak was snapped Sunday with a 2-1 shootout loss to Edmonton. San Jose, a league-best 26-8-3 away from home, can match the franchise record for consecutive road wins - set Nov. 14-Dec. 31 - when it visits Phoenix on March 25. Having a fresh Nabokov to face a team he has dominated is yet another positive for San Jose, which is within five points of Detroit for the league's best record. The Sharks have won six straight against the Wild, including all three meetings this season. Nabokov has been in net for each of those six games, posting a 1.15 goals-against average and one shutout. San Jose, which has never swept a season series from Minnesota, has held Marian Gaborik, Minnesota's leading scorer, to one goal in the last 10 meetings. Minnesota (39-26-8) moved into sole possession of first place in the Northwest with a 3-1 victory over visiting Colorado on Monday. Niklas Backstrom stopped 29 shots and Brent Burns and Branko Radivojevic had goals for the Wild, who have outscored opponents 5-1 in back-to-back wins following a five-game skid (0-2-3). Minnesota hold on the Northwest's top spot is tenuous, as Calgary, Colorado and Vancouver are all just two points behind. San Jose is the first stop on a four-game road trip for the Wild, who play their final eight contests against division foes. Backstrom has never beaten the Sharks, going 0-3-1 with a 3.22 GAA in four starts.